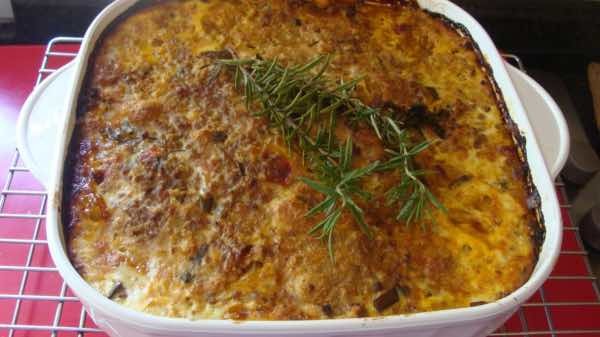 Bobotie recipes hail from the traditional Cape Malay people of RSA. Bobotie recipes are a red meat dish but by substituting with some chickpeas and vegetables you can turn it into a perfectly healthy meal. This page was last updated by Bernard Preston on 6th April, 2019. Well, nearly perfectly might be more honest; the traditional Malay recipe of red meat, white bread, spices, eggs and milk I can't recommend, I'm afraid. There are serious concerns about the health of red meat but the fact of the matter is that we continue to enjoy it despite the warning from the World Health Organisation that it is probably carcinogenic. Much concerns how it is cooked and what you have with it; notice the dark, scrumptious looking crust; that's because of the free range eggs used. Bobotie recipes make a good protein source in the diet; Bernard Preston reduces the amount of red meat, and substitutes chickpeas or lentils. 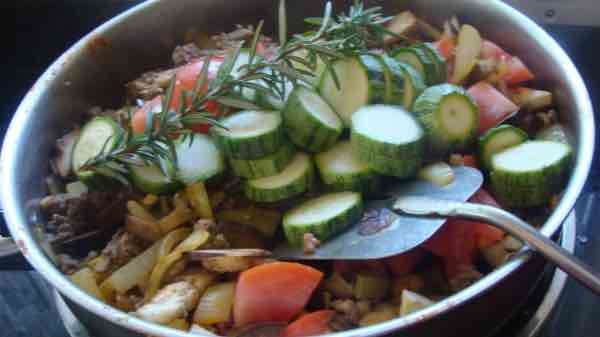 In addition he recommends adding the vegetables that are in season; today he uses sliced eggplant and zucchini squash. Let's enjoy our food but not allow it to make us a sick. Eating red meat twice a week in a dish such as these bobotie recipes is probably acceptable. The only ingredients that a family not used to cooking curries might have to acquire are the spices such as cumin and turmeric, and perhaps the chutney. As usual, because at least half the invaluable nutrients in a lemon are to be found in the pulp, we insist on using the whole fruit, less the pith. Since we should all be aiming for ten coloured foods per day, if we don't want to get cancer, this is a great opportunity to enjoy a mixed salad on the side; using whatever's in season, try to add a green, red, yellow at least. Perhaps you might want several different lettuces, a tomato, sweet peppers and avocado for example; drizzle with extra virgin olive oil and lemon juice. A bowl of homemade hummus completes any salad. Bobotie recipes hail from the traditional Cape Malay people of South Africa. 1 tsp of mixed aromatic herbs of your choice. Pulp and juice of a whole lemon or lime; one quarter of the zest. 1 1/2 cups of milk. If you only occasionally use chickpeas then purchase it by the can, but my recommendation because this is the world's favourite protein source, and Bernard Preston's too, is that you pressure cook your own and freeze them; then you'll have a ready supply on hand. 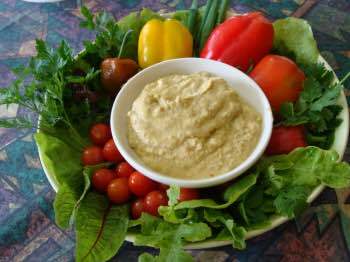 We are not vegetarians, but we eat chickpeas daily as a protein source, mostly in hummus on a green salad. Use a coarse grater to remove the zest from the lemon; toss it straight in within the sizzling onions and spices; slice the pulp and remove the pips, and then add it all in your bobotie recipes, and in all your cooking in fact. Never discard the lemon pulp; that's where most of the phytochemicals are to be found, including the vitamin C.
In fact, these days, I just slice up the whole lemon, remove the pips and add the lot; you can't taste the difference; there's a lot of nutrient, especially vitamin C in the pith too; slow food made fast is our motto; the more shortcuts you can take, provided it doesn't affect the nutrient value, the better. 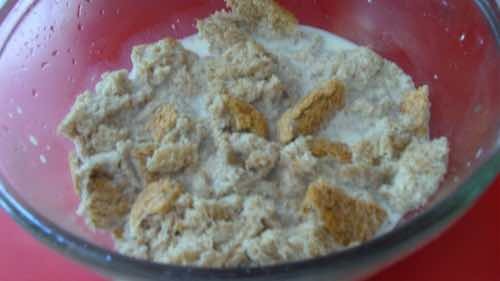 Crumble the wholewheat bread including the crust into the milk in a bowl, and set aside. 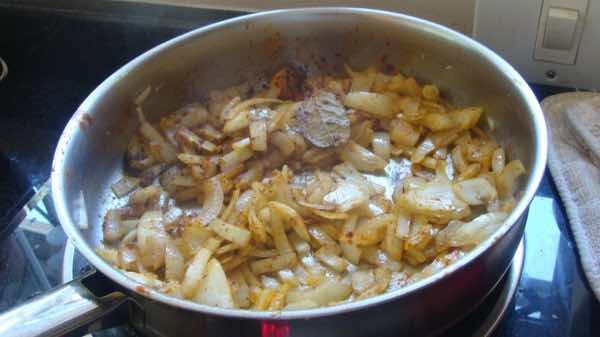 Fry the chopped onions in a tablespoon of butter in a large pot. Add the spices and simmer for a couple minutes on low heat, stirring so it doesn't burn. 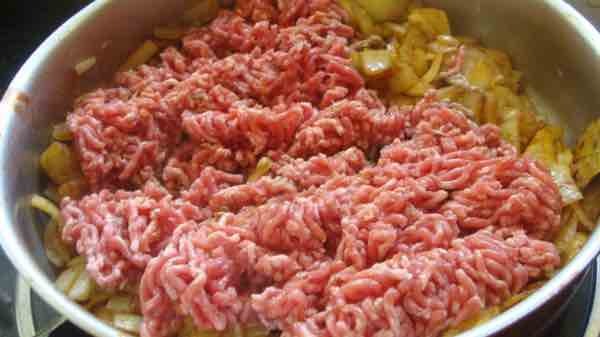 Add the minced mutton or beef and brown. Add the chickpeas, garlic, tomato, vegetables, chutney and jam, and all the lemon including the zest and pulp, plus a teaspoon of sea salt and black pepper, and simmer for ten minutes. Squeeze the milk out of the bread. Beat this milk with the eggs; don't mind the crumbs. Add the squeezed bread to the main dish and stir it in. Then pour it into a large oven proof dish. 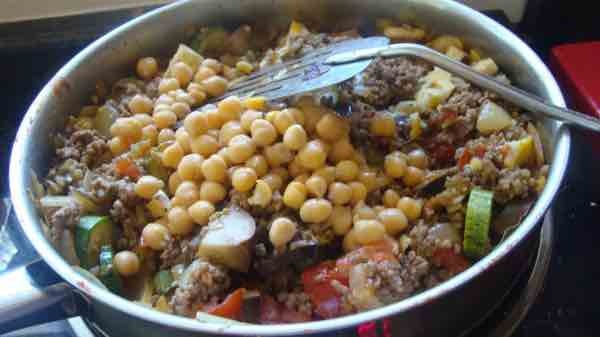 Pour the beaten eggs onto the meat, chickpea and vegetable mix. Bake in a hot oven for 3/4 of an hour; the first half with a lid on. Serve on whole grain yellow rice, with a green salad on the side. We never eat a plain red meat dish these days since the solid study done by the World Health Organization collecting together all the top quality research on red meat. It seems there's little doubt it's carcinogenic; what is in doubt is whether it's red the meat per se, or all the hormones that are pumped into them, and the corn fed feedlot; cows normally eat primarily grass. Always, in one way or another, we'll add vegetables; the coloured foods are invaluable for their phytochemicals. Toss some thyme herb benefits in the pan. A few thoughts to go with our bobotie recipes. Know your curry powder; just one teaspoon is enough if it's really hot; four might be right if it's mild; it all depends on the amount of chili. In season I would toss in a whole jalapeño. Finely squared eggplant is a wonder with any ground beef; you hardly know it's there and it seriously lowers the cholesterol problems. 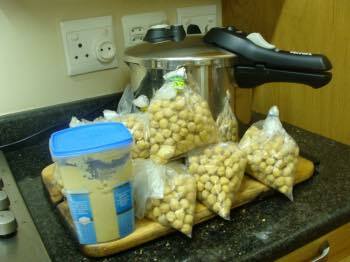 Preparing your own chickpeas, known in America as garbanzo beans, is not difficult but you do need a pressure cooker. It's a great labour and time saving device and every busy cook should have one in my opinion. They reduce the cooking time by two thirds and it's impossible to open the modern devices and spread your dinner on the ceiling. Soak the chickpeas overnight, rinse several times to remove the phytates and then again cover with water and pressure cook for half an hour. Rinse several times more, drain in a colander until nearly dry. One cup always goes immediately into our authentic hummus recipe. Notice this dish has at least five of the mandatory eight coloured foods we need to eat every day: carrots, eggplant, zucchini, tomato and lemon. Here are my top 7 functional foods; they help prevent disease and promote well-being. Freezing chickpeas makes your life a lot simpler if you have the desire to start substituting some of your red meat with legumes; such as in these bobotie recipes. Having drained your cooked chickpeas, then freeze them in cup sized packages. Very briefly, homemade bread is a huge step-up in the vitality of your family, but only if you can get real flour; millers worldwide are allowed to cheat; they can describe it as "wholemeal" provided they don't remove more than 40% of the grain; that's the germ and bran where the goodness is to be found. It's a gross deception. Healthy flour is essential for the base of your bobotie. Look for the 100% wholemeal sign; or grind your own wheat. The grinder below is not stone ground but for the price and very powerful motor, it's great. Our German Hawo is top of the range but prohibitively expensive now; but it's twenty years old, and going strong, so I'm pleased that I forked out the extra; it's paid for itself many times over. When you buy the best, it hurts only once. Think about the Mockmill. Millers remove the bran which is where the lignans are found; those are the phytochemicals that prevent breast cancer and lower cholesterol. We either make the time and spend the money to prepare good food, or a lot more on chemotherapy and statins. Five minutes every morning to make our homemade low GI bread doesn't scare me; half the price of store bread with ten times the goodness and the awesome taste; it's simply wonderful in your bobotie recipes. Happy coincidences happen sometimes; both we and the supermarket ran out of powdered cumin; the Indian lady whispered that we should rather buy the raw seed at a quarter of the price, roast and grind small quantities. Freshly ground cumin has so much more flavour, and is so easy to prepare; I do enough for a month as we use it several times a week in the hummus; keep it under olive oil to prevent oxygen in the air getting to it. What is cumin you may be asking. Eggplant is a vegetable that takes some getting used to; it must be dark blue-black and shiny; old brinjals, as we call them, are simply awful. They are a natural statin; eaten regularly along with more salad and fruit and you can probably escape the horrid side effects of the medication; does impotence worry you? These easy eggplant recipes are a good place to start. We could go on about the allicin benefits in garlic and onions, but will leave that for another page.